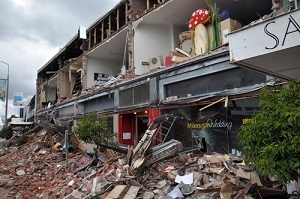 The Government’s proposing to toughen the rules around earthquake strengthening buildings with unreinforced masonry. It’s planning to update the Building Act, so that buildings with dangerous parapets, facades and verandas, are assessed and upgraded twice as quickly as other properties. The Minister for Building and Housing, Nick Smith, is referring to buildings with masonry that can fall onto public roads, footpaths or other thoroughfares local councils say have enough foot or vehicle traffic below them to justify more urgent upgrades. He estimates around 2000 buildings will fall into this new category of ‘priority buildings’, which will include most commonly used retail areas or central business districts around the country. He explains, “The effect of being a ‘priority building’ is that the times for assessment and upgrade requirements are halved. Smith says it’s a matter of striking a balance between keeping people safe, while keeping costs down and preserving heritage buildings. “These latest changes are about targeting the requirements at parts of buildings that pose the greatest risk in areas of high and medium seismic risk”, he says. Smith says it’s a matter of learning lessons from the February 22, 2011 Canterbury earthquake. “Falling parts of unreinforced masonry like parapets and facades killed 35 people that tragic day, including every passenger on the Red Bus except Ann Brower. I pay tribute to her fastidious advocacy and professional research that has persuaded us to change the law and prioritise these buildings for upgrade. The law changes are included in the Building (Earthquake-prone Buildings) Amendment Bill, which was reported back from Parliament’s Local Government and Environment Select Committee today. The Bill includes a number of changes that were announced by the Minister in May, such as zoning New Zealand into areas of low, medium and high risk, and the prioritising of education, hospital and emergency buildings. It’s still subject to a second reading, select committee stages and third reading. The Government aims to have the legislation passed by the end of the year. and just what is causing the hold up at the moment? Is it lack of engineers as well as lack of magic pots of money? Its neither lack of engineers nor lack of money in my view as I think over time resourcing and levelling can be solved. The problem is that we have to undertake weather tightness, fire and moisture testing along with any facades in the high street or above 2 stories of in parts of multis. We can no longer just put the structural members back in place with larger bolts as that ignores the updating of all the health and safety risks on the site specific health and safety facade plan (SSSP). So yes a DSA, but also an AS/NZS4284:2003 which governs the weather tightness amongst other tests. This is rooted in Building code E.2.3.2 requiring external water to be addressed in roofs and external walls material alterations requiring a building consent not for 3604 but engineered design. In summary, we are asked to simultaneously quantify not just the seismic risks with all the other very important building codes that have attached themselves to our building structures since that structure's last building consent but we undertake weathertight facade and engineering design. That's what I see as working best and fast.